Another day in paradise | Turning my world upside down! Well the weather is not cooperating but it doesn’t stop us from enjoying Florida. Today was a very late start after breakfast in bed. We walked the length of Duval street with warm coats on. Stopped at the beach for a cup of tea. Then we searched for chocolate to commemorate Valentine’s Day. Of course by 3pm we had to stop for a drink and a snack. Fruit and chicken salad was delish! It went well with my 1st Mojito of the day. 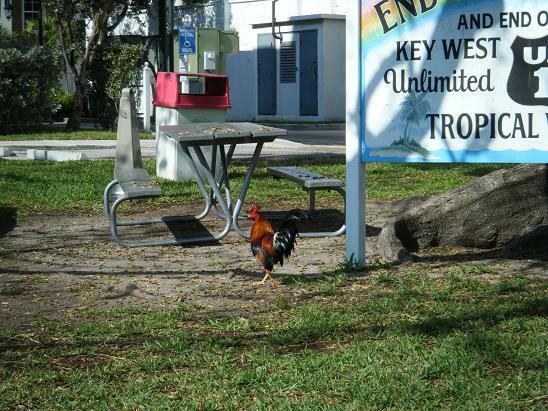 Did I mention the roosters of Key West? They are all over, roaming the streets freely. And there are many cats as well. Quaint! We are back at the hotel for a glass of wine to fortify ourselves before a swim and another walk to watch the sunset on Mallory Square. Dinner is supposed to be Chinese take-out to celebrate the Chinese New Year. We check out at 6am tomorrow and drive back to Miami to fly north in the afternoon. This trip was way too short! At least the honeymoon continues in Ottawa, even if I do have to get back to work. I am not promising I will be mentally present mind you.